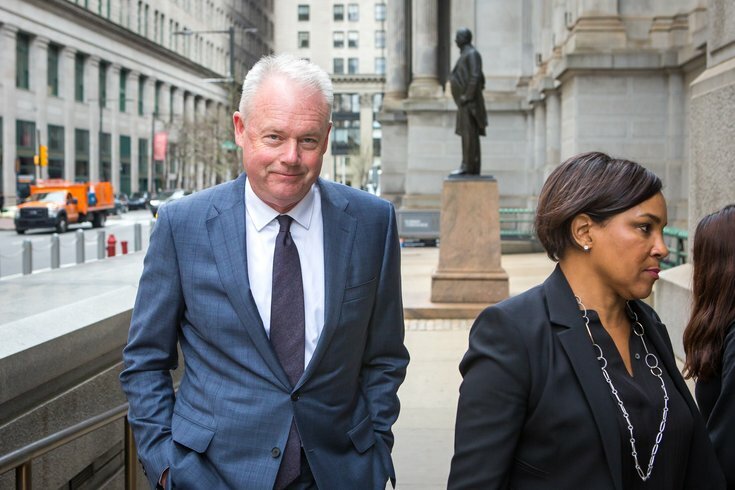 Starbucks CEO Kevin Johnson, Chief Operating Officer Rosalind Brewer, and others from the Starbucks executive team enter City Hall in Philadelphia, Monday, April 16, 2018. Starbucks CEO Kevin Johnson met with Philadelphia Mayor Jim Kenney at City Hall on Monday afternoon, four days after two black men were arrested for not leaving one of his Center City stores. Johnson and a team of Starbucks officials, including Vivek Varma, executive vice president of public affairs, entered the building around 2:45 p.m. Monday. The meeting comes after Johnson apologized on national television for an incident on Thursday night coffee chain’s store at 18th and Spruce streets. The chief executive reportedly talked with Kenney and Police Commissioner Richard Ross via phone over the weekend. Johnson was in Philadelphia in an attempt to quell public outcry over the incident. Many consider it a case of racial profiling. Johnson kept his comments brief after meeting with Kenney. "We had a very constructive meeting with the mayor and the police commissioner (and) other government elected officials," Johnson told reporters. "We really appreciate the transparency and the spirit with which we're working together to ensure that we address the situation that happened last week in the Starbucks store." Rosalind Brewer, the company's chief operating officer, added that the conversation was "very productive." "This is just the beginning of a lot of work that we plan to do together," she said. "We look forward to a very positive outcome here." In the meeting, Johnson described the structure of Starbucks, noting that some locations are licensed while others are company-owned, according to Kenney. Starbucks officials also pledged to implement unconscious bias training and review company data to see if there are similar complaints elsewhere in the country, Kenney said. They will provide Philly officials with a report that includes a demographic breakdown of the company's workforce management. "We're thankful that they have the attitude that they have and that they're going to examine their guidelines and make sure that this doesn't happen again," Kenney said. "They were very contrite and sorry for what happened. We'll work with them going forward." The two men were arrested as they waited for a friend to arrive at the shop. A store manager called police after they refused to order anything and declined to leave the store. One of the men also asked to use the restroom. As the officers arrested the two men – both Realtors – their friend arrived. Kenney called the arrests "horrible" and "heartbreaking." "It's a societal issue," Kenney said. "People react differently based on the color of people's skin and it's wrong. It shouldn't happen and it shouldn't happen again. But we'll keep on working to limit the number of times things like this happen. We don't want to see this happen." A witness filmed the arrests and posted the video to social media, sparking protests. More than 30 protesters were at the store early Monday morning. The peaceful rally effectively halted business at the store at 18th and Spruce streets in Center City for more than three hours Monday, as Johnson addressed the arrests on national television early Monday morning from Philadelphia. Megan Malachi, one of the protest's organizers, said the unjust arrests that occurred at the store were not an isolated incident. "This is a systemic issue," Malachi said. "Everyone in the city government is complicit and so is Starbucks. Ever since this happened, we have been getting reports that this is not the only place in the city that this is occurring. "This is outrageous, this is insulting and we are not going to stand for it." The arrests were captured on video by a Rittenhouse Square resident, which quickly went viral on social media as the story went national. News of the arrests ignited protests outside the store on Saturday, and spurred a weekend apology from Johnson, who had been said to be headed to Philadelphia in an effort to deliver a personal apology to the men. 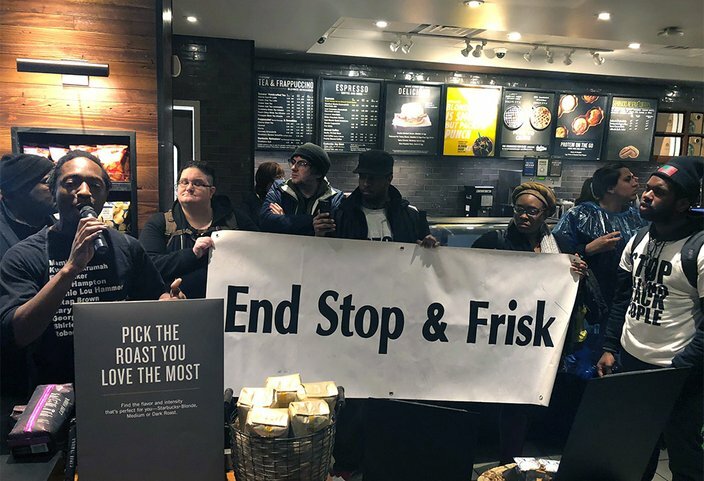 The protesters – organized by Philly for REAL Justice and the Black and Brown Workers Collaborative – urged Starbucks to fire the employee who called the cops. They also demanded the arresting officers be fired, too. "We have a racist barista, an incompetent staff here at Starbucks and then a general racism of police in the city," said Anthony Smith, of Mt. Airy. "It's very important to note that this is not specific to Starbucks and police react here the same way they do all across the city." The Starbucks manager who called the police is no longer working at the store, according to multiple media reports. The protesters also called for Starbucks to issue an official apology to the men and create a policy that would prevent employees from calling the police on citizens. "Starbucks calls the police for every little incident that occurs in their stores," Malachi said. "Starbucks is a gateway to mass incarceration in this city for our people. That is unacceptable." As the protest played out, Johnson called the outcome of the incident "reprehensible" in an appearance on Good Morning America. He said Starbucks needs to provide more clarity around its guidelines and training around unconscious bias. "Now, there are some scenarios where the police should be called," Johnson said. "If there's threats or disturbance, those may be appropriate times. In this case, none of that occurred. It was completely inappropriate to engage the police." Johnson also offered another apology and stated his intention to meet with the two men. According to CNN, the two men have agreed to meet with him. At the rally, a Starbucks employee was rebuked as she attempted to address the demonstrators. "You have lost your opportunity to have a voice," Malachi said. "You have lost your opportunity to have a choice into what happens. We don't want you to talk at all. We want you to stop talking, because you weren't talking the other day, when you arrested those two brothers – were you?" After the rally, a Starbucks employee on-scene declined comment. Ross previously said the officers did "absolutely nothing wrong," saying the men were deemed to be trespassing because they allegedly refused to make a purchase or leave the store. He stood by that assertion on Monday, but told 6ABC that the arresting officer did not want to make the arrest. "I mean, the officers were in there for about 15 minutes before an arrest was made, so that should suggest, clearly, that wasn't their first course of action that they were thinking," Ross said. Kenney said the officers will not be fired for arresting the men. "They were called to assist a store manager with an issue," Kenney said. "We have to figure out the nuances of that, also." The two men, who have not been identified, were not charged because Starbucks employees later decided they did not want prosecute them, Ross said. Police blocked off the portion of 18th Street that runs parallel to the store. Inside, protesters took turns at the microphone, demanding action from Starbucks and decrying racial profiling. "We're not just here because of this Starbucks, in this location, with this manager," said Deandra Jefferson, of Mt. Airy. "We're here because this is not only a pattern within the city ... but this is how our country is structured. ... This is what systemic white supremacy looks like in action."